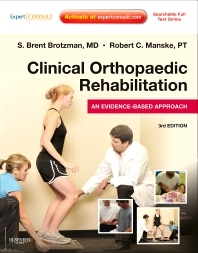 In Clinical Orthopaedic Rehabilitation: An Evidence-Based Approach, Dr. S. Brent Brotzman and Robert C. Manske help you apply the most effective, evidence-based protocols for maximizing return to function following common sports injuries and post-surgical conditions. A well-respected, comprehensive source for evaluating, treating, and rehabilitating orthopaedic patients, the 3rd Edition guides you on the prevention of running injuries, the latest perturbation techniques, and the ACL rehabilitation procedures and functional tests you need to help get your patients back in the game or the office. You’ll also find a brand-new spine rehabilitation section, an extensively revised art program, and online access to videos demonstrating rehabilitation procedures of common orthopaedic conditions at www.expertconsult.com.